The Wire has learned that a week before these changes at the channel, BJP president Amit Shah told a group of journalists in parliament house that he planned to "teach ABP News a lesson". 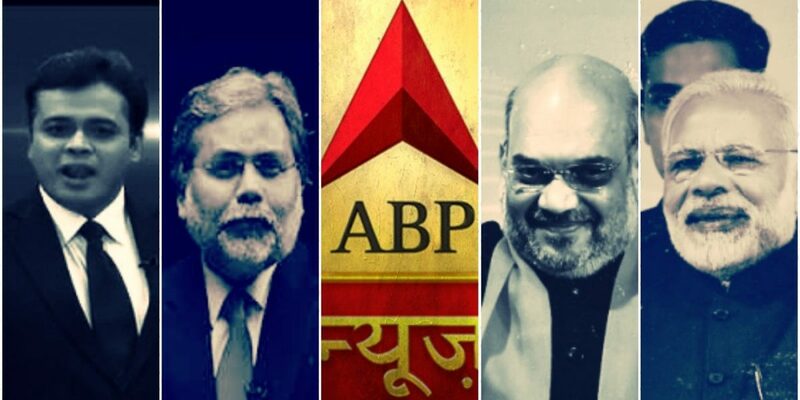 New Delhi: The resignation of two top television editors at ABP News and the benching of a third is being seen in media and political circles as the latest example of a prominent media house stooping to conquer the affections of the ruling party. On Wednesday, the channel’s management announced the resignation of its editor-in-chief, Milind Khandekar. This announcement was followed soon by the departure of Punya Prasun Bajpai, anchor of the popular nightly show, ‘Master Stroke’. 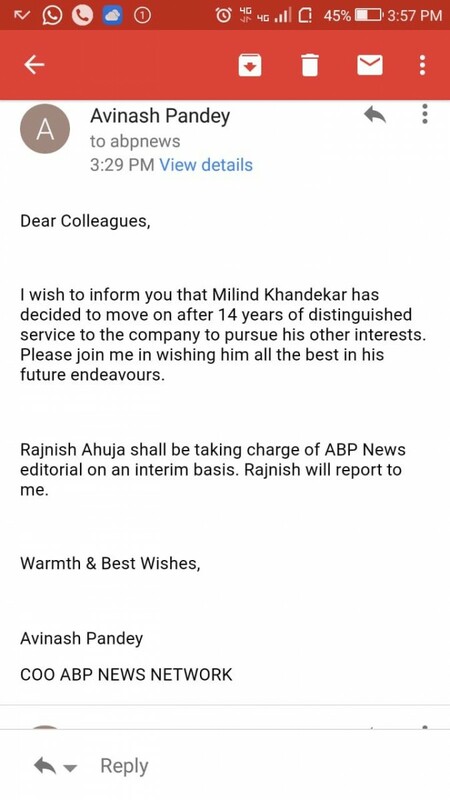 Email sent by Avinash Pandey, COO of ABP News, announcing Milind Khandekar’s resignation as editor. Bajpai’s exit – whether he resigned or was asked to leave is not clear – comes weeks after he angered government ministers by reporting that a Chhattisgarh woman held up by Prime Minister Modi as a success story for his rural schemes had not “doubled her income” as he had claimed. Two days ago, he was told he would no longer be anchoring ‘Master Stroke’. Alongside these two high-profile exits, ABP sources told The Wire that senior news anchor Abhisar Sharma has been pulled off air for 15 days after he reportedly questioned instructions from management that there be no criticism of Modi on his programmes. The Wire has learned that in the run up to these changes at the channel, BJP president Amit Shah told a group of journalists in parliament house last week that he planned to “teach ABP News a lesson”. The ‘trigger’ for the channel’s action against Abhisar was his juxtaposition of Modi’s claim – made in a recent speech in Lucknow – that the law and order situation in Uttar Pradesh had improved, with two brutal murders that took place in the state the next day. Even as Abhisar took the prime minister’s name, commotion broke out in the news room with the CEO of ABP News Network Atideb Sarkar insisting the show be taken off the air immediately. Sources in the ABP newsroom say Sarkar reprimanded Khandekar for not immediately pulling the plug on the show, with the latter insisting it could not be done as only five minutes of the bulletin had elapsed. When the bulletin ended, the anchor was instructed not to criticise Modi again. Later, the channel’s management told him that he would be grounded for the next 15 days. Instructions were also allegedly given to all the channels executive producers that there is to henceforth be no content critical of the Modi government. According to the sources, these decisions came directly from Sarkar. The same evening, they say, Bajpai was told his show would henceforth be anchored by Chitra Tripathi. Speaking to The Wire, ABP sources also confirmed what has been the subject of speculation on social media for some days now – that the channel has been deliberately blocking the telecast of Bajpai’s nightly ‘Master Stroke’ show from various DTH platforms so as to not offend the government. Over the past few weeks, viewers across the country have claimed that they have been unable to watch Bajpai’s show. According to a senior journalist associated with the channel, the blackout started a day after they aired a follow-up story contradicting claims made by the government about the Chhattisgarh woman Chandramani Kaushik having doubled her income by availing of one of Modi’s schemes. Bajpai himself took to Twitter last month to criticise the blackout. “You can black out the screen during Master Stroke, but we will convert it into a ‘blackboard’ and write the truth on it”. The Wire wasn’t able to independently confirm the claim of systematic blocking. The episodes of the show are still available on the channel’s YouTube page. Bajpai was recently criticised by Union ministers, including defence minister Nirmala Sitharaman, minister of state for information and broadcasting Rajyavardhan Rathore and minister of state for agriculture Gajendra Singh Shekhawat for “unapologetically aligning themselves to the agenda of deriding PM Narendra Modi’s efforts by all means”. On June 20, during a video conference interaction between Modi and farmers across the country, Chandramani from Chhattisgarh’s Kanker district claimed that her income had “doubled. An ABP News report on July 6, however, said the claim of doubled income was false and that the farmer had been tutored to say what she did. The channel had sent a reporter to the farmer’s village to fact-check the claims made by her during the video conference, which was later shared by the prime minister on social media by many. When government ministers criticised ABP news for having distorted Chandramani’s views, the channel sent its reporter back to her village to speak to a wider cross-section of people. In its second report on the issue, ABP also met with some other women who are part of self-help groups in Kanker, who were confused by Kaushik’s claim that her income had doubled. “We have put in money from our pockets and in the last five years, we have not even recovered that from sitafal pulp,” one of the women said. “I don’t know what Chandramani is talking about. There is absolutely no profit,” the other woman said. When ABP went back to Kaushik and asked her about the comments of other members of the self-help group, she was quiet. ABP insiders believe Bajpai was targeted by the Modi government for controverting the official line. Channel sources say Milind Khandekar’s exit from the channel was triggered by the pressure that had built up over the Chattisgarh report, which the BJP considered especially problematic because of widespread rural distress and the perception of farmers across the country that the party is not doing enough to address the problem. According to the media industry speculation, industrialist Sanjiv Goenka is planning to acquire the news channel from the Sarkars, who will continue to run the family’s newspapers — Anandabazar Patrika and The Telegraph. Goenka, who is not related to Indian Express founder Ramnath Goenka’s family, is the chairman of RP-Sanjiv Goenka Group. “Sanjiv is that classic businessman: in Bengal he will pay homage to Mamata, in Delhi to Amit Shah and Narendra Modi,” said a senior journalist who wished to remain anonymous. The Wire made several attempts to reach out to Bajpai, Sharma and Khandekar. While Khandekar and Sharma refused to comment, Bajpai remained unreachable. A questionnaire has been sent to Atideb Sarkar about the recent developments in the channel. This story will be updated if and when they respond.